After posting my first Valentine Couple, I got a phone call from someone (Barbara), asking if I would be interested in interviewing her parents as they’d been married for 65 years. Of course! I quickly packed up my notebook and camera and headed on over there. I came in and we all introduced ourselves and I took a seat. I noticed the New York accent and asked where they were from. Mary explained they’re from New York, but moved here to be closer to their daughter. Ronnie is in a motorized wheelchair. I only mention this because his story is amazing on its own. He was a 19-year-old bricklayer when he was diagnosed with Polio. “You did?” I asked in surprise. I expressed that as a retired nurse myself, Polio was not a big problem in the medical field when I was working. What I knew of it was limited knowledge. Ronnie was full of stories, too, which he shared with me. In marriages, one is always the storyteller or comedian and in this one, it was Ronnie (I wonder who it is in my marriage?). “How did you two meet?” I asked going back to my notebook. “It was a blind date,” Ronnie added. “Really? A blind date?” This was interesting. I asked about the families; if there were difficulties since these two were raised with different cultural upbringings. Historically speaking, from the early 1900s to around the late 1950s, upbringing had a lot to do with your family’s culture and it was very important. That being said, Ronnie is Italian and his grandparents hailed from Italy, while Mary’s family was Irish and German. Mary’s mother was an Irish immigrant and came through Ellis Island and her father is of German descent. “Everyone got along well,” Mary said of the two different families. Eventually, Ronnie quit bricklaying and Mary quit working at the bank. She stayed home to raise their four children while Ronnie opened up his own fast-food business, Chicken Delight. As we were bringing things to a close, I asked for their own recipe for a lasting marriage. If anyone guessed that God was the first thing on their list, they’d be right. I finished up and closed my notebook. These two, like all of the others, has been an inspiration and truly, it was a pleasure to have met them. 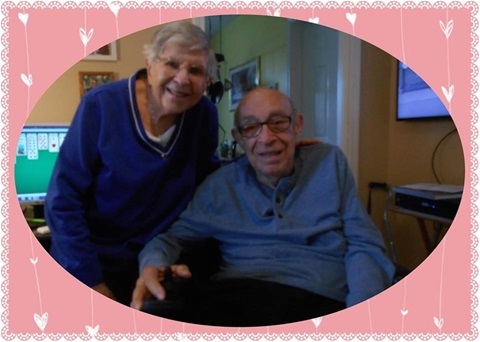 Thank you for this opportunity to write about you and I hope that you both have many more wonderful Valentine’s Day celebrations together.